Want to connect with Susanna? Hi everyone! I am 18 years old and have had experience in childcare for 5 years now, and currently have a 15 month old daughter as well, so I am very comfortable around babies and also have experience with older children. I have a certificate in diet and nutrition, food safety training, and instructional planning and will happily do housework, run errands, and cook nutritious meals for your children! I volunteer in the nursery at my church and have references for childcare. I am a non-smoker and will be graduated high school on January 20th and will be available to start full-time work then. I am willing to get a criminal record check and will be first aid certified by the end of January. I am only interested in babysitting and live-out positions as I have a daughter and a husband to come home to :) My wage is absolutely negotiable and I am very flexible as to how often I work. Looking forward to meeting you and your family! 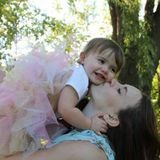 Experienced nanny/babysitter looking for full time summer position! Im an 19 year old girl going into Early Childhood Education at Algonquin College, and I love working with kids!